In another life I was a bee. In another life I was a belly dancer. In another life I was a vegetarian and a vegan and a may-aswell-not-eat-anythingan. In another life I was a tightrope walker and an acrobat and occasionally a juggling clown. In another life I wore slippers shaped like pigs. In another life I was a witch. In another life I lived on an island with coconuts and a sandy beach. In another life I had six toes. In another life I was pedantic and paranoid and another p word. In another life I made it to seventy without breaking a bone. In another life I sold magic beans. In another life I flew kites and wore frilly frocks. In another life my heart wasn’t broken. In another life I met a goblin and he taught me how to cackle. In another life I drove everywhere I went. In another life I only wore purple. In another life I was cunning and cognisant and I drank nothing but coca cola. In another life I was a bad kisser. In another life I hated sugar, and squirrels, and the sea. In another life I was a yeti, living in an igloo. In another life I climbed a tree and fell out of it. 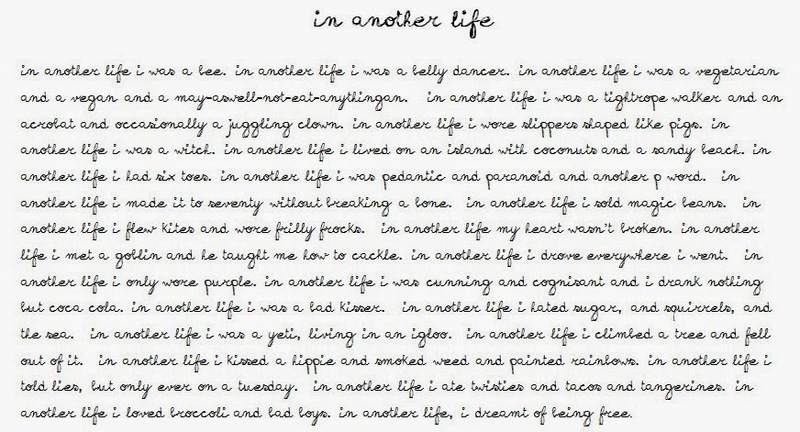 In another life I kissed a hippie and smoked weed and painted rainbows. In another life I told lies, but only ever on a Tuesday. In another life I ate twisties and tacos and tangerines. In another life I loved broccoli and bad boys. In another life, I dreamt of being free.